during DCI's annual winter business meeting in Indianapolis. Board of directors of individual Drum Corps International World and Open Class corps organizations are scheduled to gather this weekend in Chicago. 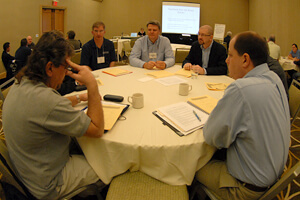 The meeting, which was first organized as part of DCI's annual winter business meeting in 2010 and hosted again as part of the 2012 DCI World Championships in Indianapolis, is intended as an opportunity for corps boards to discuss common issues and share best practices for running their organizations. "In our Crusader board room discussions, we inevitably wonder how many other DCI corps boards have dealt with similar issues as us and what policies, controls or systems may be in place amongst our peers," Boston Crusaders board member Garry Martin said when organizing this year's meeting. Traveling and meeting at their own expense, representatives of 17 of 23 World Class corps are expected to be in attendance. The session is scheduled to run the afternoon of Saturday, April 6 through noon on Sunday, April 7. In preparation, attendees were surveyed on various issues related to their organizations, the results of which will be used to guide discussions throughout the weekend. "The intent of each segment is to have significant interaction among board members and active engagement on numerous topics," Martin said. Troopers board member John Masterson will facilitate the sessions which will include a "State of the Union" address by DCI Executive Director Dan Acheson on Sunday morning.